Young adults often have the ‘travel bug’ and want to see the world (and get as far away from parents as possible!). But there is the perception that the money spent on that ‘travel bug’ can stop you from owning your own home. 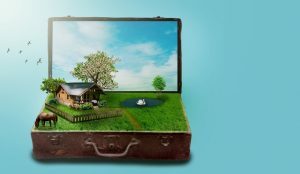 Young adults know the importance of getting into the property market as soon as possible, but they also want to travel before they settle down with career and family. The short answer is yes, but it may require that you will have to think outside of the box. There are two key issues which influence purchasing your first home – the financial side of things (especially the deposit) and also location. Let’s discuss each of these two factors. When it comes to the financial side of things, unfortunately there will be no getting around the fact that a stable income (usually a job) will be needed to show that you are able to finance the mortgage. This will require some short-term sacrifices and perhaps may require that you will have to put some of your travel plans on hold for a year or two. However, the joy of living in the 21st century is that you don’t need to be located in the one spot in order to have work and have a “stable income”. There are several work from home or abroad opportunities which will enable you to generate a good income while travelling. You also have the ability to start your own business as well. A deposit will also be required for your home, but if you are able to take advantage of the first home owners grant it will help dramatically with the deposit. If you are able to tap into the bank account of mum and dad (utilise their equity) that may be an option as well. Once you finally own your own home, the financial side of things is not so much of a priority. Of course you need to meet your ongoing repayments and expenses, but there are strategies to get other people to pay these while you are seeing the world. The other big question when it comes to home ownership is where do you want to buy a property? This is a really important consideration especially if you don’t know where you will be in the next five years. Your future career choice may require you to have locational flexibility therefore deciding a location may not be as straightforward for you. If location is an uncertainty, my answer is simply this: Don’t purchase your first home purely based on a lifestyle decision, consider it as an investment decision as well. Ask yourself these questions: “Where do I believe will be a good area to purchase a property? Do I anticipate this area will still remain a good area to live in five to ten years’ time? Will there still be employment opportunities and infrastructure (schools, roads, hospitals etc.) in my area going forward? Don’t overcomplicate the above questions – you don’t need to complete months of research in your desired area. And I would strongly discourage you seeking “advice” from property spruikers who promise the world about these “hot spots” in “whoop whoop”. They will generally receive massive payments to sell these properties and they are not required to legally act in your best interest (unlike financial planners). Personally, I think the best place to start is close to home. The area that you have grown up in is a good starting place to purchasing your first home. You will know whether the area is a sought after area that is growing in both population and employment opportunities, or whether it is an area which people are leaving (referred to as a ‘talent drain’). Ok you have your own home, congratulations, now what? If you want to travel or relocate, I would suggest the best thing would be to rent out your place. The rent will go a fair way to cover your existing mortgage, which will give you the flexibility to rent in your desired location. This strategy is more commonly known as ‘Rent-Vesting’, where you hold investment properties in good areas (an investment decision) while living in your preferred location (a lifestyle decision). Your rent should increase every couple of years as well, meaning more money will go into your pocket the longer you hold the property. You also have a place of your own to return to should you select to cease globetrotting. Most importantly, your property is likely to increase in value while you are travelling. You can then use this equity to purchase another home in the future, putting you well ahead of those who still haven’t entered the property market. If your $300,000 first home only increases by 5% per annum, that is an extra $15,000 in capital you have made in your first year alone! Before you start looking at RealEstate.com.au or Webjet.com.au, there are at least four important issues you need to consider before proceeding. Firstly, if you have used your first home owners grant or the first home owner saver scheme to fund the purchase of your first home, then you will generally need to remain in your own place for a period of twelve months before you can look at some other options. Note that the rules vary from state to state, so seek advice to confirm the rules before making any changes. Secondly, you need to do a really good budget to confirm you are able to fund the shortfall in your property before you travel. I would also build in a buffer of at least $100 per week for when things go wrong. Thirdly, you will need to review your home and contents and transfer them to landlord insurance policies, which will slightly increase the costs. Finally, I would recommend seeking taxation advice from an accountant to determine the tax implications of renting out your home. There are a few things to consider, but one of the key tax considerations is the ‘six year rule’. In a nutshell, you can rent out your current place of residence for up to six years and you will not be required to pay capital gains tax like you would with an investment property. There are strict conditions in relation to this, so again seek tax advice before proceeding.